EarthFriendly™ Reusable Produce Bag - Nice Stuff Co.
Are You Tired Of Your Grocery Bags Splitting Before You Get Home? Look no further with the Easy Packing Bags you will receive 4 detachable and reusable shopping bags. Perfect for those of you that want to make grocery shopping effortless! Let's Be Eco-Friendly In 2019! People's reliance on plastic bags is flooding the world with plastic pollution.Studies show in about 20 years, the oceans will have more plastic weight than fish.Plastic Shopping bags, primarily used by big chain grocery stores are the most used plastic that arerarely recycled because of its thin profile. They make their way straight to garbage bins and can take up to a full century biodegrade. Make the switch to reusable grocery Bags in 2019! The Last Grocery Bag You'll Need! ✔No more plastic shopping bags that rip. ✔This eco-friendly reusablegrocery bag expands to hold up to 40 lbsof groceries. ✔The bag clipsonto the side of your shopping cart, so you can add itemsquicklyandeasily. ✔Featuring avelcro closure, as well an outer pocket that's perfect for wallets, coupons, and recipes. ✔The Grocery bag also Folds flatfor easy storage. ✔Also great fortripsto the laundromat and dry cleaner, storing knitting supplies, toys or beach stuff. Makes Your Shopping Experience A Breeze! ✔Just Clip And Shop!-The easy to useclip-onfeature allows you to fit your grocery baginsideyour shopping cart using the specially designed Sturdy handles to make iteasierto load and carry your items. 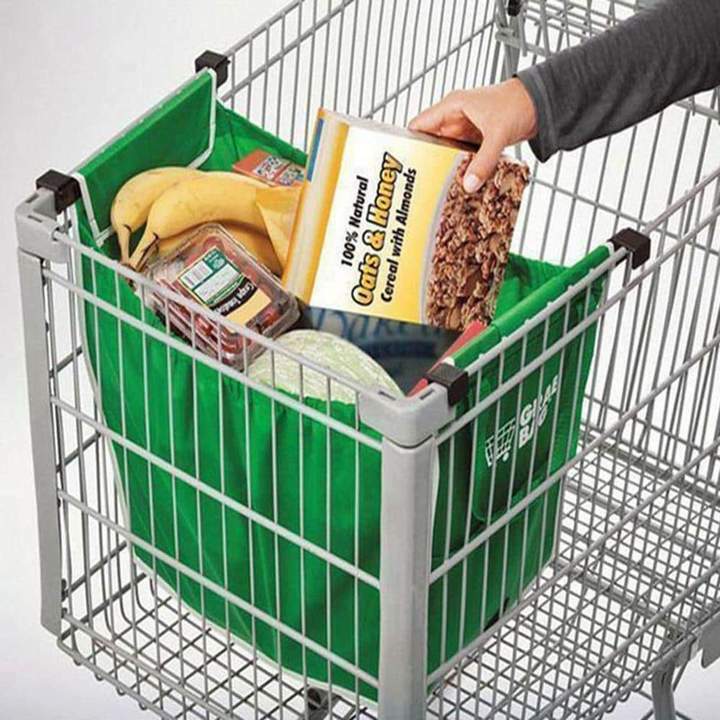 ✔Easy Storage!-The Ultimate grocery bagsimply folds upwhich makes it easier to store awaywithouttaking up much space. ✔No Need To Carry Around Many Bags!-With the Ultimate grocery bag, you can carry up to40 lbs of groceriesin one bag!